What is Mitosis? 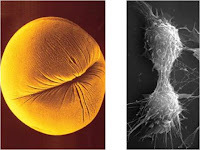 What are the different stages or steps of mitosis? An adult human being is made of billions of cells. This journey started from a single cell zygote. Zygote divides by mitosis adding cells to the existing once in a controlled fashion. The division is genetically programmed. Each cell has instruction when to divide? And, when to stop division? This is such a critical process that is essential for survival and sustenance of an individual. Some cells divide throughout lifetime like blood cells, others cannot divide once formed like nerve cells. At the end we are perfectly designed. Mitosis is the division responsible for growth, repair and replacement. Centrosome move towards opposite poles of the cell and spindle begins to form. The asters that surround the centrioles and the spindle together constitute the mitotic apparatus. Chromosomes are attached to the spindles through their centrosomes. Chromosomes are lined up in one plate to form the equatorial plate. Smaller chromosomes are central in position whereas the larger ones are peripheral. 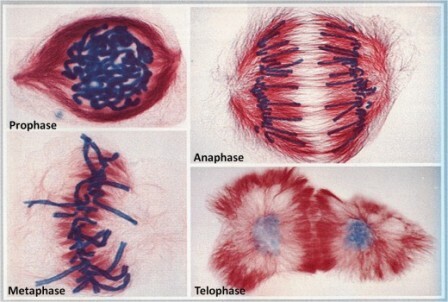 The centromeres of the chromosomes divide simultaneously as anaphase proceeds. Two chromatids of each pair separate called as daughter chromosomes. The two sets of chromosomes migrate towards the poles. Chromosome movement is brought about by the shortening of spindle fibres attached to the centromeres. It begins when the two sets of chromosome reach opposite poles of the cell and the spindle disappears. New nuclear membrane is formed around each set of chromosomes. 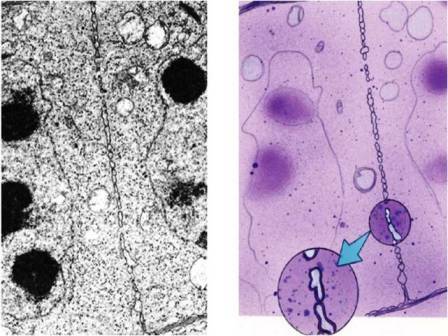 Nucleoli reappear at nucleolar organiser region. Each daughter cell gets the same complement of nucleoli as of mother cell. It is the division of the cytoplasm. A cleavage furrow appears at the beginning of Telophase. The furrow deepens as spindle breaks down. The ingrowing constrictions join and separate two daughter cells. There is a formation of cell plate between the two daughter nuclei. This grows from the middle towards the periphery and finally joins the cell wall. The cell plate represents the middle lamella between the walls of two adjacent cells. It keeps the chromosome number constant and genetic stability in daughter cells, so the linear heredity of an organism is maintained. It helps in growth and development of zygote into adult through embryo formation. It provides new cells for repair and generation of lost parts and healing of wounds. It helps in asexual reproduction. It keeps a check on cell size as overgrown cell is induced to divide. Opportunity for differentiation due to multicellular condition. Colchicine is an alkaloid obtained from Colchicum autumnale and many species of the family Liliaceae which inhibits cell division by preventing the formation of mitotic spindle. The duplication of chromosomes takes place; the formation of daughter nuclei and division of cytoplasm is prevented. So the number of full chromosome sets increased which is called polyploidy. The plant breeders are using the cochicine induced polyploidy for producing new varieties of economically important plants.